in the public parking lot. If necessary we will meet in the basement garage of the TIDES #111 building which is on the left side. The space is well lit and dry. If you want to be part of the carol walk but not walk at all, go directly to Locals outdoor patio. We’ll receive our complimentary wassail drink and those who have booked for dinner will eat early if they wish. (probably about 5:30 PM). Carols are a beloved tradition of the holiday season but many don’t actually sing the songs. 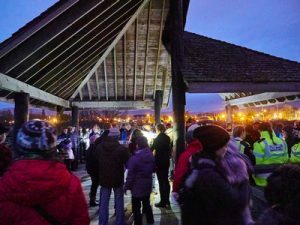 On Sunday, December 6th, initiate your holiday season by singing to birds, seals, other residents and each other while enjoying the unique winter ambiance of the K’omoks Estuary. 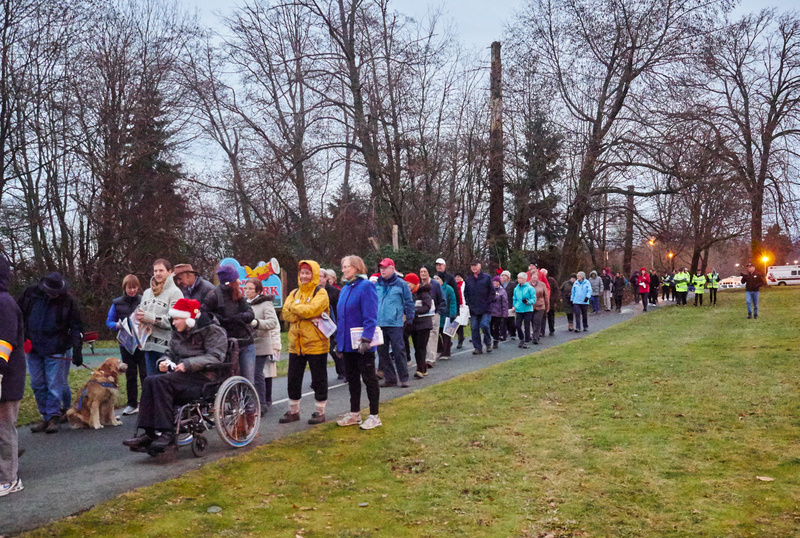 The fifth annual Comox Valley Estuary Carol walk begins at dusk (4:00 pm), Advent Sunday, at Mansfield Drive parking lot (behind Serious Coffee at 26th). Carolers may also join at the Air Park parking lot. Locals Restaurant at the Old House offers a complimentary wassail cup to all wandering minstrels arriving about 5:30 pm. Those staying for dinner should make a reservation (250-338-6493) and may order off the regular a la carte menu or select the 3 course seasonal special. 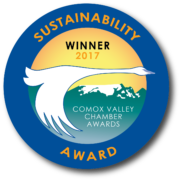 In addition to the Airpark and Riverway carol walkers, Captain Dan Clair of Comox Harbour Charters takes carolers ($30) on his decorated boat. (250-218- 9146). They depart from Comox Harbour and will meet near the government dock, tides permitting. 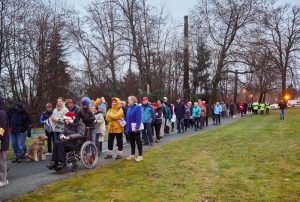 For carolers with limited mobility, it’s a good way to participate. Joanna Finch is carol leader. 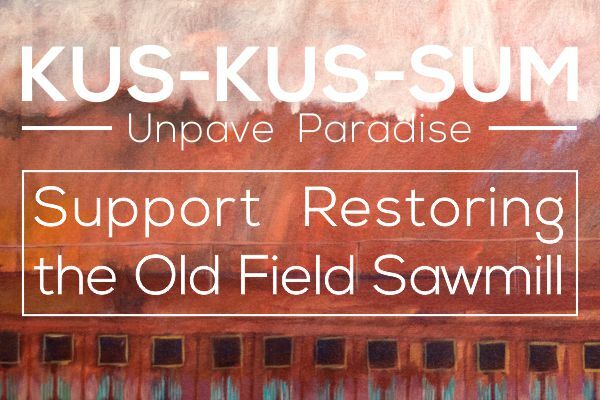 She has prepared an online carol booklet that can be downloaded and printed. Listen to the song Dona Nobis Pacem, to learn the words. Joanna is a well-known singer/songwriter who directs VocalEase classes and workshops. Her love of natural sounds infuses her leadership so she offers a “voicestra” at the beginning of the walk. “It’s not necessary to be a choir singer – like the other Estuary inhabitants, we’ll just raise our voices.” Choral groups and choirs and musicians might add interesting harmonics. Children and dogs welcome! We live in a Canadian rain forest so dress for the weather. Carry a water bottle. Bring a flashlight or headlamp if possible. Park vehicles at Mansfield Drive, the Air Park or near the Old House. St. John’s Society volunteers will patrol. On behalf of Project Watershed, Betty Donaldson organizes the volunteer team. It isn’t a fundraiser and registration isn’t necessary. The purpose is to enjoy making joyful sounds in this outdoor environment while continuing the tradition of holiday sing-alongs. “…all creatures that live on the earth share a single light by which they see and a single atmosphere by which they breathe” (Marcus Aurelius, 121 – 180). For more information, contact the PW office (250 703 2871).